This new text makes it simple for beginning computer science students to design algorithms first using pseudocode and then build them using the C++ programming language. 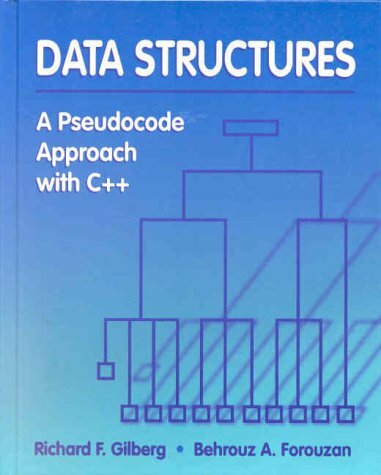 Based on Gilberg and Forouzan's successful text, Data Structures: A Pseudocode Approach with C, this new book emphasizes a practical approach to data structures. poems and non-fiction articles have been published in various periodicals. For Cablevision TV, he wrote, narrated, and appeared in programs on the Scholastic Aptitude Test. He also edited the College Boards text book of Amsco publications. As an Adjunct Assisstant Professor at St. John's University, he was selected to be a consultant for the compact Norton Introduction to Literature, 8th edition. At Barnel ndash; Loft Publications, he was a part ndash; time proof reader and copy writer. For two years, he served part ndash; time as Assistant Dean at a local college. A graduate of Syracuse University with a B.A. degree in English, he also earned a Master's and Doctor's degree from Columbia University in New York City. He is married to the former Lucille Waaser of Baldwin and has two children, Stephen Paul, Jr. and Suzanne Sparacio Soetje. This is his second novel; the first, Strawberries and Diamonds, an Ellis Island Mystery, was published in 2008.